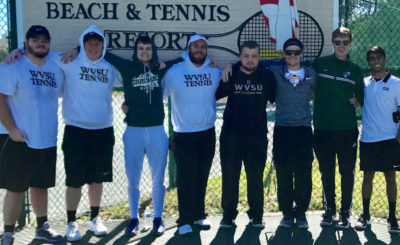 March 17, 2019 April 8, 2019 Noah FulksSportsNo Comment on Women’s Tennis Split First Two Matches of Spring Break; Win 4-3 over Barton, Lose 4-3 to Francis Marion. 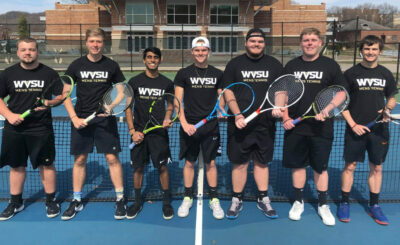 After being swept in doubles against Barton, the Yellow Jackets rallied with Sophomore Nika Tadic rallying to win in the third set and clinch the win for State 4-3. For their first match on their spring break trip, the Yellow Jacket women’s tennis team traveled to Barton College in Wilson, N.C.
State was swept in doubles play to open the match with Laura Isbey and Nika Tadic losing the closing doubles match 7-5 at #3 doubles. Kierstin Hensley put State on the board with a 6-1, 6-2 win at #1 singles, while Isbey won 6-2, 7-5 at #2 singles, and Hanna Kruglova won 6-3, 7-5 at #3 singles. Chante Malo and Sydney Miller each dropped their matches at #4 and #6 singles to leave every tied at 3-3 with Tadic still on court. After cruising 6-1 in her first set, Tadic then lost the second set 6-3. 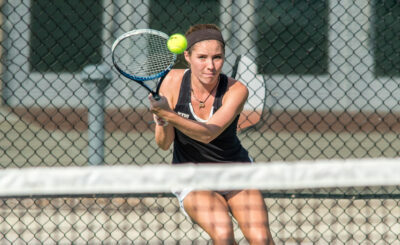 In the deciding third set Tadic would win 6-4 and clinch the win for State. In their second match State would win the opening doubles point, but lose after Francis Marion completed a singles comeback. State would win the opening doubles point after Sydney Miller and Hannah Kruglova would win at #2 doubles, and Laura Isbey and Nika Tadic winning at #3 doubles. In singles action Kierstin Hensley put State ahead 2-0 with a 6-3, 6-1 win at #1 singles, and Isbey winning 6-1, 3-6, 6-3 at #2 singles to give State a 3-0 lead. 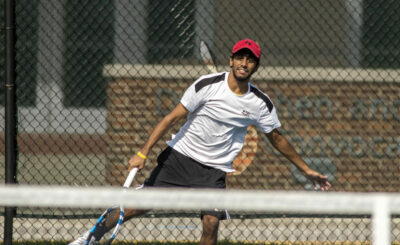 Francis Marion would rally the final four singles matches to win the match 4-3. Malo and Tadic would drop their matches in three sets.